An old Nordic joke says that it is easy to find your way out from the Icelandic forests - just stand up. But now this joke has become outdated. Today you have at least to jump up, and there are patches of real forests. Reforestation of the erosion-plagued island has begun to show results: thick, up to 20 m high coniferous forests are visible in valleys shielded from the wind and on some mountain slopes. In Reykjavik, the capital, where only a few decades ago trees grew only in graveyards, the streets are being lined with imported broad-leaved trees. The new woodlands have also brought new fauna and flora to the country - including birds such as the blackbird (Turdus merula), chaffinch (Fringilla coelebs) and goldcrest (Regulus regulus) and several species of fungi. When the Vikings first settled in Iceland 1 100 years ago the land was forested, as described in the medieval sagas, "from the feet of the mountains to the seashore". Forests covered perhaps 30 percent of the island's total area (102 819 km2). However, the cold, windy climate did not support high forests with great species variation. The absence of most of the common northern European or Canadian species is explained also by the country's geographical isolation. Archaeological research has shown that the forests consisted mainly of downy birch (Betula pubescens) and to a lesser extent dwarf birch (Betula nana), which were the only tree species to survive the last glaciation, which ended about 10 000 years ago. There was no evidence of coniferous trees (except creeping juniper, Juniperus horizontalis), even though the country is in the boreal forest zone. The sagas record that these early human settlers cut down the trees for fuelwood and building materials. They also brought sheep and horses, whose grazing prevented the regeneration of the forests. Some two centuries after settlement, humans had created the Icelandic landscape as it is known today: barren land, dominated by deserts, tundra and grasslands. A transition to a colder climate in the fourteenth century made conditions for plant life even harder. The young, volcanic and porous soil (the result of a history of volcanic eruptions), heavy rainfall (2 000 to 4 000 mm yearly in parts of the country), strong winds and sparse vegetation resulted in widespread erosion after the trees had vanished. 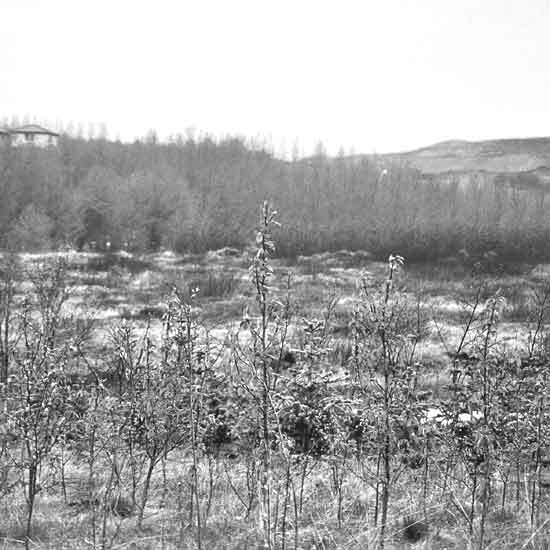 Afforestation began in the first two decades of the twentieth century, carried out at first mainly by groups of intellectuals and businessmen. The government did not really become involved until the 1950s, when it became much more active in terms of legislation, research and financial support. By adding a forest tax to cigarettes during the 1960s and part of the 1970s, the government was able to support the tree-planting activities of both the private forest societies and farmers. In the 1980s and 1990s government activities expanded rapidly, with erosion control and recreation as the main objectives. President Vigdís Finnbogadóttir made afforestation a priority and a popular concern. In the years of her term, from 1980 to 1996, the Icelandic state budget for forestry increased from US$880 000 to US$4 227 000, mainly because of support to farmers' afforestation programmes. In addition, private investors, local communities, forest societies and other entities spent approximately US$4 million on afforestation in 1996. Today, farmers and landowners plant and tend trees around buildings that only a few decades ago stood in a bare landscape. Schoolchildren take pride in planting trees, and adults take satisfaction in pointing out trees they planted during their school years. Since 1955, forest laws have banned clear-cutting of the native forests except by permission of the Iceland Forest Service (IFS) (founded in 1907), and land reclamation is intended to lead to establishment of woodlands where possible. The latest forest law regarding local afforestation programmes states that at least 5 percent of the country, or 215 000 ha of the country's lowlands, shall be transformed to woodlands during the next four decades. The increase in woodlands has not occurred without conflict with livestock farmers. For centuries, the commons were used for sheep and horse grazing, and the plantations have had to be surrounded with fences to protect them from animals - resulting in many square plantations around Iceland. However, in recent decades the number of grazing animals has declined. More and more of the former grazing lands have been fenced up, allowing both natural regeneration of birch and plantations of this and other species. The most common trees planted are Siberian larch (Larix sibirica) and native birch. Many foreign species have been imported. Promising broad-leaved imported species include the recommended Alaskan black cottonwood (Populus trichocarpa), as well as silver birch (Betula pendula), quaking aspen (Populus tremula), grey alder (Alnus incana), Sitka alder (Alnus sinuata) and thin-leafed alder (Alnus tenuifolia). Alders have shown great potential for soil amelioration on eroded or unvegetated areas. Trials with the balsam poplar (Populus balsamifera) from Alaska - a close relative of Populus trichocarpa - have also been initiated. Iceland has imported coniferous exotics such as Scots pine (Pinus sylvestris), Sitka spruce (Picea sitchensis), Norway spruce (Picea abies) and lodgepole pine (Pinus contorta). In 1962 the woolly aphid, Pineus pini, caused such severe damage to the Scots pine that planting of this species has been abandoned. Sitka spruce seemed to have a promising future in Iceland until a mild winter followed by a severe spring frost in 1963 caused almost total damage. Today, new provenances and better knowledge about suitable sites have made it possible for Sitka spruce to become widely used in forestry in Iceland. Norway spruce, however, cannot tolerate the strong, cold winds and can only be used in the most sheltered places. The Alaskan lodgepole pine was more successful. It grows today in both coastal areas and some parts of the interior. It also has commercial uses, being popular as a Christmas tree. The planting rate is about 1 800 ha per year, so about 5 million woodland plants are planted each year. Projects often start with seeding of lupins (nitrogen fixers) to bind and fertilize the topsoil. Today, there is no forest industry in Iceland, but on fertile, sheltered, well-drained sites, IFS predicts that the fast-growing Populus trichocarpa will yield industrial timber on 30-year rotations. (In comparison, conifers need rotations of up to 60 to 100 years to provide timber.) In the eastern part of the country, where the climatic conditions are most favourable, 80 landowners propose to establish at least 15 000 ha of productive forests during the next four decades. Despite these efforts, only 1.4 percent of the country is considered forest - yet the potential for afforestation in Iceland is clear. Source: Eysteinsson, T. The historical development of forests in Iceland and present status.